Former Cobblers boss Rob Page has been named as the new Wales Under-21 manager. The Football Association of Wales today announced Page’s appointment as the new Wales intermediate manager on a four-year contract. As well as taking charge of the Wales Under-21 squad, Page will also oversee the Wales Under-17 and Under-19 teams. Page’s first competitive games in charge will come in September when the U21 squad begin their UEFA Under 21 Championship qualifying campaign. During an 18-year playing career, Page made more than 500 senior appearances across spells with several clubs, most notably with Watford where we captained the Hornets as they were promoted to the Premier League. Page also made 41 appearances for Wales. 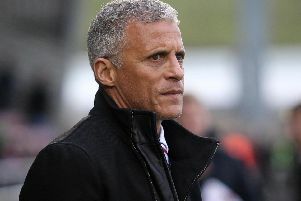 After hanging up his boots, Page coached and then managed at Port Vale in Sky Bet League One, before leaving Vale Park to take over at the Cobblers in May. Following a solid start to his stint in charge at Sixfields, the team’s form dipped in the winter months, and Page was sacked after Town were hammered 5-0 at Bristol Rovers at the beginning of January. The 42-year-old has spent the past two months as first team coach at Nottingham Forest. The FAW’s decision to appoint Page follows on from the Football Association appointing another former Cobblers boss, Aidy Boothroyd, as England’s Under-21 supremo.